So, I can’t help but mention that I was once-upon-a-time, a fan of the Castlevania series. You know, back when it was the “muscular guy with a whip kills Dracula” kind of game. When did I miss the transformation to “Effeminate androgynous pretty boy reluctantly kills Dracula” game? 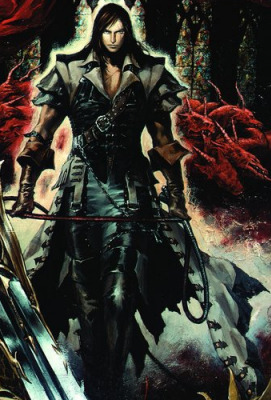 Or, better yet, of these two images, which looks more like a goddamed Vampire killer? They’ve both killed Dracula, but seriously if you chose anything other than the right image (Trevor Belmont) than you haven’t seen how a vampire killer should look like. Seriously, what was wrong with the “muscular guy with a whip”? He was built like a tank, jumped like one, and, seriously, killed Dracula with a whip. Of course, the newer Castlevania “Metroidvania” style games are pretty fun, too. Pingback: Oapboap.org » Update, new VGA. Trevor Belmont was a beast what r they doing all the new vampire killers look like fags the new game coming out for the xbox 360 is going to be the best castlevania game ever im looking forward to it and dantes inferno.